Yesterday some media were already drawing concerns over MasterChef’s numbers after it did 850,000 on Monday. They may have spoken too soon, as it lifted to 1.03m last night with a win in two demos. The Voice dipped to 1.21m but has nothing to worry about while the Blind Auditions remain in play. Even House Rules was up on last Tuesday’s 702,000 -now at 729,000. Seven Year Switch has proven to be a hit for Seven, rising from 820,000 to 849,000. Nine won with 28.2% then Seven 27.6%, TEN 21.4%, ABC 16.6% and SBS 6.2%. The Voice was #1 with 1.21m for Nine then Nine News (1.11m / 1.06m), A Current Affair (955,000), Hot Seat (635,000) and Lip Sync Battle (492,000). Seven News was (1.11m / 1.01m) for Seven then Seven Year Switch (849,000), Home and Away (786,000), House Rules (729,000) and The Chase (665,000 / 420,000). Best Bits pulled 315,000. 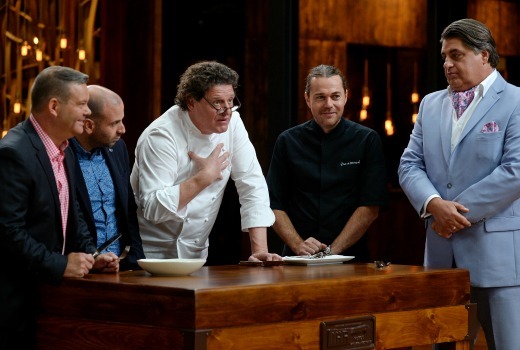 MasterChef Australia did well with 1.03m for TEN. NCIS was 646,000, The Project was 622,000 / 503,000, TEN Eyewitness News was 516,000 and NCIS: LA was 490,000. ABC News (772,000) led for ABC then 7:30 (585,000), The Indian Dream Hotel (580,000), Catalyst (539,000) and Foreign Correspondent (353,000). On SBS it was Great Continental Railway Journeys (363,000), Insight (227,000), SBS World News (127,000) and Dateline (125,000). Shaun the Sheep showed up multichannels with 309,000. Random question. With the Morning Show, Today Extra & Studio 10 what do the figures refer too? First hour? Second hour? How they are coded? Who beat who and when? I should know I read your blog enough… Just not sure. They are ranked as highest / lowest regardless of coding. The Morning Show and Today Extra usually codes 9-11 then a second number for final half hour. Studio 10 codes its first hour 8:30-9:30 which is usually the lower number. It rates better from 9:30-11:30 because it isn’t up against Sunrise / Today where it lifts off a very low base. Did Quantico air last night? Wanted to watch it on Plus7 today but has not been added. Also not available on iTunes making me think it did not air on 7 last night?? Thank you David. Unbelievable given it got 700,000+ back in October! Hopefully uploaded soon. You make a good point. I was surprised this year how quickly Seven moved on from its new US titles. If this is the new trend should viewers turn up for the next batch? Probably not. It is hard to follow them sometimes. If it wasn’t for you your readers wouldn’t have a clue what is going on with 7 dramas. I have recently turned to Netflix for much of my US viewing so 7 might miss out on my loyalty. I have watched everything from Desperate Hosewives, Brothers & Sisters, Grey’s Anatomy, Private Practice to the new shows like HTGAWM and Quantico on 7 but fear next year I may no longer tune into their new offerings. Especially given they don’t make it very appealing. After The Voice I watched 2 episodes of Mad Men on SBS On Demand. Every time there was an ad break “this video is unavailable” came up so the whole 90 minutes was ad free. Way to go SBS!! Wow never heard of that before. Lucky… My 2011 smart TV SBS OnDemand app goes to commercial and then comes back with “Cannot find video” to something to that effect, so I can’t watch the rest of the show. Same thing on a 2013 Sony Smart TV. iPad apps works fine, but I would much rather watch on the big screen.